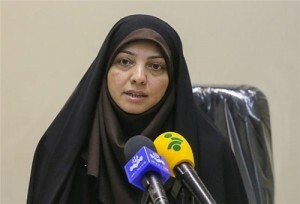 TEHRAN (FNA)- Deputy Governor of the Central Bank of Iran Minou Kianirad lashed out at the western powers for their illegal and inhuman sanctions against the CBI, saying that pressures are targeted at the Iranian people. Kianirad said that the sanctions on the CBI are violation of international laws and human rights of the Iranian population by affecting transfer of money and cargo. Addressing the Islamic Banking Seminar in Tehran on Wednesday, she said the CBI, however, made a great deal of efforts to foil effects of the sanctions. Kianirad said that national economy registered $200billion turnover despite the sanctions. Washington and its European allies accuse Iran of trying to develop nuclear weapons under the cover of a civilian nuclear program, while they have never presented any corroborative evidence to substantiate their allegations. Iran denies the charges and insists that its nuclear program is for peaceful purposes only. Despite the rules enshrined in the Non-Proliferation Treaty (NPT) entitling every member state, including Iran, to the right of uranium enrichment, Tehran is now under four rounds of UN Security Council sanctions and the western embargos for turning down West’s calls to give up its right of uranium enrichment. After the UN Security Council ratified a sanctions resolution against Iran on June 9, 2010, the United States and the European Union imposed further unilateral sanctions against the Islamic Republic over its nuclear program, mostly targeting the country’s energy and banking sectors. Tehran has always dismissed West’s pressures and stressed that sanctions and embargos merely consolidate Iranians’ national resolve to continue the path of progress.